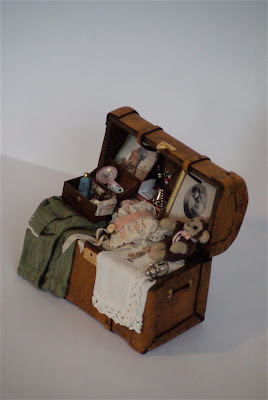 Dollhouse Miniatures by Felma J.: Joyce Bernard Miniatures Featured! April Give A Way! 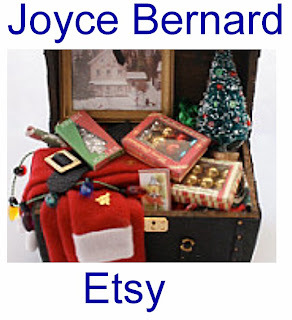 Joyce Bernard Miniatures Featured! April Give A Way! My dear friend Joyce Bernard, also known as "THE TRUNK LADY" for her Themed Trunks is now selling her one of a kind trunks and other signature miniatures on Etsy. Please take a look. When I first met Joyce years ago at a Miniature Club I was hungry for information and struggling to find my way in a hobby that I had fallen in love with. The club was designing a wired Building. I was so lost because I joined the club just after the wiring project. Joyce sensed my distress and offered to come to my home the next week and teach me all about wiring. This is not the building we wired. The beginning of our long term relationship began on that day and although Joyce moved to another state a few years ago our friendship remains the same. Joyce and I met at least once a week and worked on miniatures. She was usually the teacher and I the student. 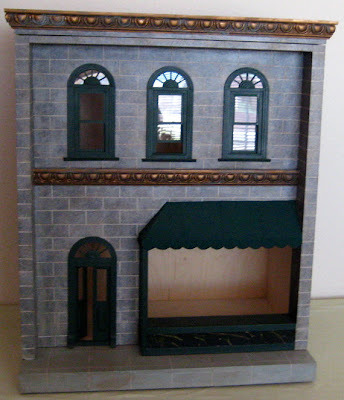 When Joyce sold my miniature drapes at a show in Northern California, it was the beginning of the excitement I feel when I sell on eBay and the thrill I get when someone comments and wins one of my give aways. When it finally hit me that God had blessed me with one of the finest teachers of miniatures, I happily soaked up all the information that Joyce freely shared with me. She never told me how sought after she was for her trunks. I found out on my own. Sort of like when you discover the Holy Spirit. It is there for you to tap into it's power. You just have to find out about it and when you do, you just want to soak up all the information that you can so that when you are faced with road blocks in your life, help is there for you based on what you have learned. Amazing. 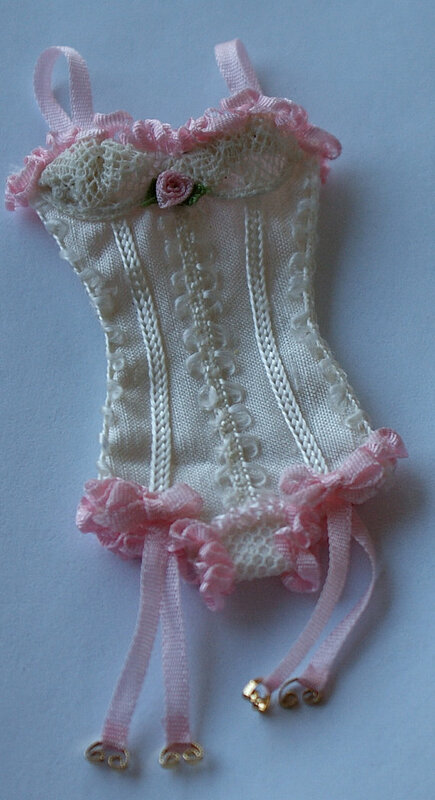 Hats, purses, dresses, underwear, trunks and you name it, Joyce and I made it in mini. Those were the good old days. These trunks are the best in the world. Although she makes most items in her filled trunks, she has searched world wide to locate the finest leather and fabrics. She also sells unfilled trunks. Yes, Joyce taught me how to make these too! April Give Away was made with Joyce in mind. To enter: Be a follower of my blog and leave a positive comment on this post only by Monday, April 29, 2013 before 6:00 PM Pacific Daylight time. 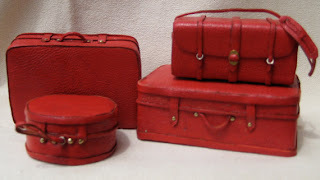 Although not a requirement, it will be appreciated if you post a picture of one of Joyce's trunks on your blog along with my give away. Thanks. Thanks to all of my new followers and special thanks to all of you that have been with me from the very beginning. I love comments and yours have made my day on many days. Thanks for another wonderful giveaway. This suit is adorable. Please, count me in. I put the link on my blog. What a great story, Felma, about your precious friendship with Joyce. 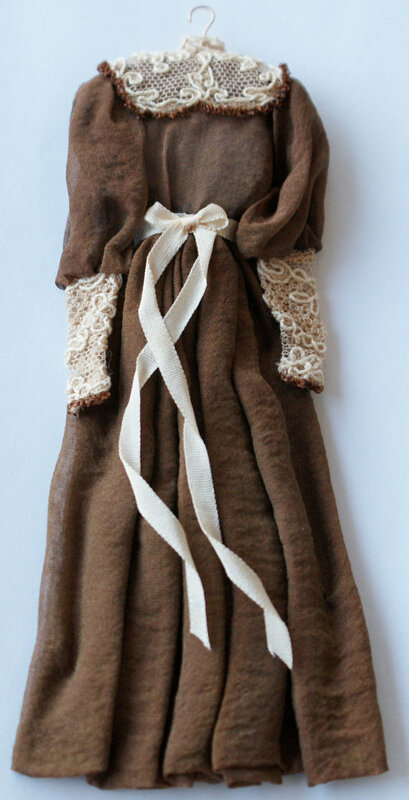 Her trunks and other miniatures are really fantastic and the brown dress is gorgeous to see, love it! Always cherish your friendships in good, but also in the bad times, said my mother and she had right about that. I would love to participate in your give away, so please count me in. I'll put the link and picture on my blog. Dear Felma what a wonderful, generous giveaway. I'll put your link on my blog. Anyone who uses it can automatically see Joyce's stunning work. 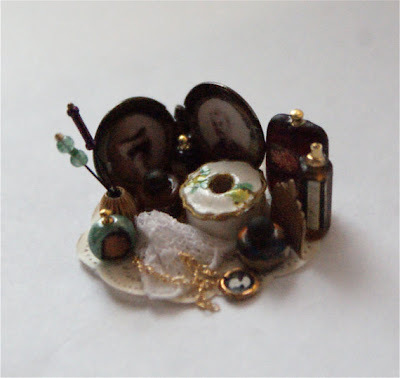 I think she is a master miniaturist. Bless you for being such a nice and loyal friend. Keep well and take care. Hola Felma, realmente es una conmovedora historia de amistad! Las buenas amigas permanecen y comparten, me alegro mucho por ustedes dos. Los Baúles de Joyce son muy hermosos, tiene mucho talento. Me gustaría participar en tu sorteo, lo anuncio con una imagen de Joyce. 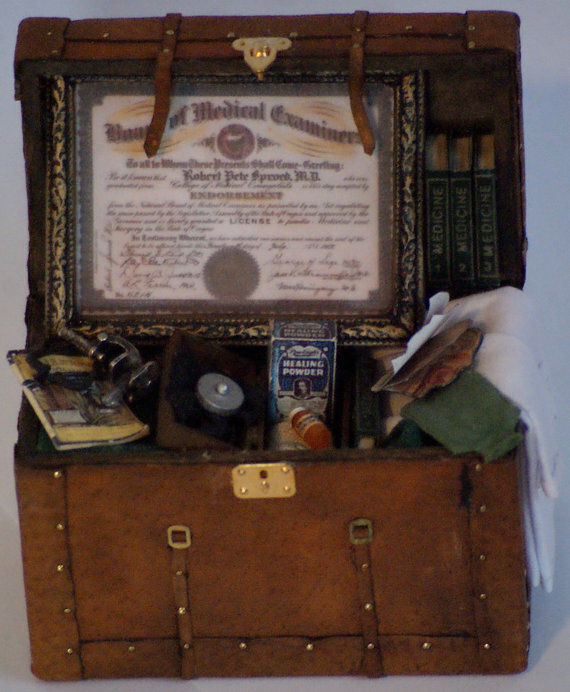 I have been admiring Joyce's items for a while now. She makes lovely things. It is a blessing to have been taught by a great teacher. I need one of these. I never win on any of these giveaways but sometimes it is fun to enter them. So please count me in. Also I am not able to put links on my blog for some reason blogger will not let me do it. Love the trunks and, as always, your work! Please count me in! I put a link on my blog, no pics though as I di't know how to put pics in the sidebar. What a gorgeous Giveaway,please count me in. I am your follower and I`ll put the link into my blog. There is also a Giveaway in my blog if you are intereseted..
What a great friend you have in Joyce, and you both are very talented. I love the trunks and the underwear and the dress you are giving away. Amazing work. Please count me in to the giveaway. a ver si puedo comentar ahora...me encantaría participar ! Thank you. I cannot leave comments on your blog anymore and haven't figured out why. Take care. Me encantaría participar, subo el enlace a mi blog. Besos. Me gustaria participar, que pasaba que no se podia comentar en tu blog? Felma, muchas gracias! creo que ahora ya esta arreglado! Los trabajos de Joyce son espectaculares!! Another wonderful suit. Thank you very much to your give away. I would like to participate on it. Joyce's trunks are fantastic. Joys work is stunnig!!!! Thanks for another wonderful giveaway. Please, count me in. I´ll place a link on my sidebar.